New York Yankees catcher Yogi Berra in March 1957. Yogi Berra, the ever-quotable former catcher and manager, died Tuesday at the age of 90. By quality, he was one of the best catchers ever, amassing the fifth-most total wins above replacement at the position and the 11th-most WAR per game.1 By quantity, he played in 13.2 percent of all of the Yankees games in history and more World Series games than any other single player. But more than the obvious accolades — the three Most Valuable Player awards, the 10 World Series wins — Berra was exceptional by virtue of his improbability. As a 19-year-old, Berra participated in the D-Day invasion as a member of the U.S. Navy, fighting from a boat at Omaha Beach, where there were some 2,000 casualties. He was later injured in Marseilles and earned a Purple Heart. After he returned to baseball, he played in just 77 minor-league games before advancing to the majors. Because of his service, Berra didn’t begin his career in earnest until he was 21 years old. Berra was unlikely even as a baseball player: All of 5 feet 7 inches tall, he launched 358 home runs during his career, 90 more than anyone his height or shorter.2 Berra was an unusually disciplined batter, striking out in only 4.9 percent of his plate appearances. That combination of power and plate discipline is exceptionally rare in MLB history. Sluggers tend to strike out at higher-than-average rates because they are often selective and waiting for a pitch to drive. Players with more than 350 home runs since 1940 have struck out, on average, in 15.8 percent of plate appearances, more than three times Berra’s rate. No one else with a strikeout rate below 5.5 percent hit more home runs than Berra did during that period. When you add up his position, size, power and plate discipline, Berra is unique in all of baseball’s history. Long after he retired, Berra remained one of the most quotable and beloved figures in baseball’s considerable history. Measured by the frequency with which his name is mentioned in books, Berra is more prominent by a large margin than any of the four catchers who produced more total WAR in their careers. Instead, Berra’s name appears in books at a frequency closer to that of historic greats like Mickey Mantle, Joe DiMaggio and Ted Williams. Berra’s outsize popularity is a testament to his special character and likability, which came to overshadow his no-less-impressive or -unusual accomplishments on the field. CORRECTION (Sept. 23, 5:17 p.m.): A previous version of this article incorrectly described comparisons of Berra’s strikeout rate and home runs with those of other players. 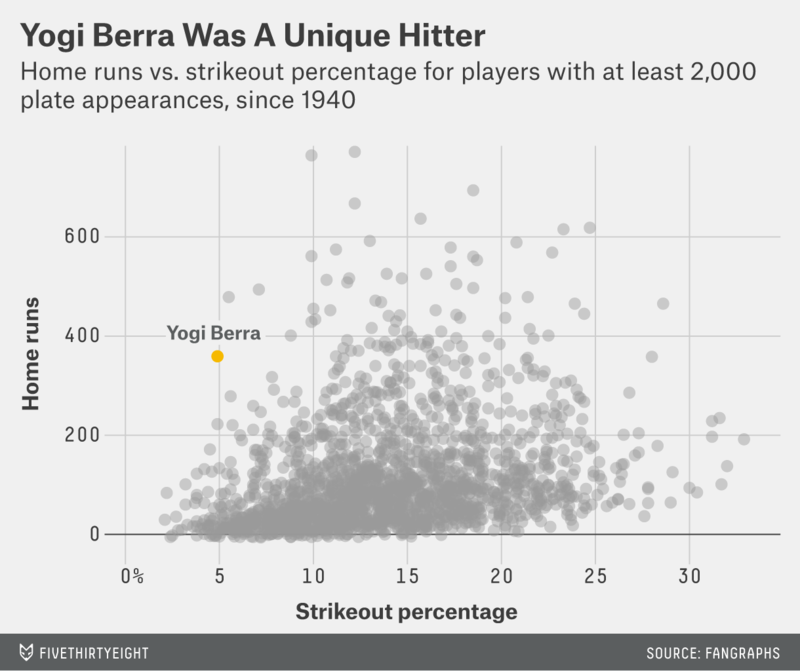 In the text, we compared Berra’s strikeout rate with that of players who have hit more than 350 home runs since 1940, and, in the chart, we compared his strikeout rate and home run total with those of players who have had more than 2,000 plate appearances since 1940. None of those comparisons were with all players with more than 350 home runs or more than 2,000 plate appearances. I applied a minimum of 1,000 games played at catcher. Here I am using the Lahman database numbers. The runner-up is Joe Morgan (5 feet 7 inches, 268 home runs). The shortest player who hit more home runs than Berra is Mel Ott (5 feet 9 inches, 511 home runs).